Process mining is complicated. It requires a lot of man hours to examine and analyze, even for the professionals. We wanted to change this. Process mining with the help of DataLovr is so easy and intuitive, we can even call it a "game". The analysts are shown cases (processes) and are given the choice of marking this case as "relevant" or "irrelevant" with regards to the thing that is being searched such as a bottleneck in our "Analysr" module. 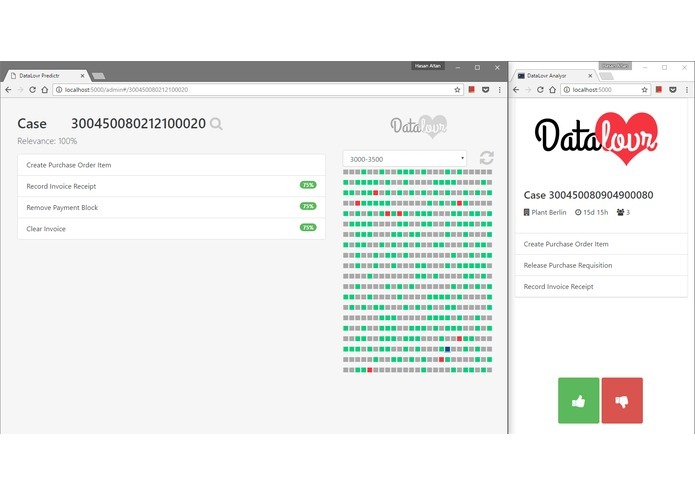 DataLovr learns from your choices and analyses the whole data set, predicting which other cases may be relevant in the search. This prediction is visualized in our "Predictr" module in a simple and intuitive fashion. We used the Python-Flask webserver as backend with Scikit-Learn for the machine learning. The client side is created in HTML5-CSS-Js. The client side libraries that were used are "JQuery", "Angular.js", "Bootstrap". Designing the interface, storing the data, and picking the machine learning model were challenging but we believe we came through quite successfully in the end. The fluidity of the whole project is what we are proud of. What makes projects great is not a single feature but the little things that come together to create a fluid and intuitive experience for the user. Integrating different modules to create a finished product/demo.